An artist concept of a lightweight space telescope that deploys a lens made from flexible membrane. Contrary to Hollywood's ideas, today's spy satellites that orbit the Earth at fast speeds and relatively lower altitudes can only snap photos for the U.S. military and intelligence agencies. Taking live video of a single location would require satellites to hover by matching the Earth's rotation in geosynchronous orbit about 22,000 miles (36,000 kilometers) high — but creating and launching a space telescope with the huge optics arrays capable of seeing ground details from such high orbit has proven difficult. As a solution, DARPA — the Pentagon's research arm — envisions a lightweight optics array made of flexible membrane that could deploy in space. 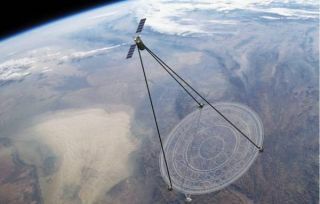 Ball Aerospace has just completed an early proof-of-concept review as part of a DARPA contract worth almost $37 million. "The use of membrane optics is an unprecedented approach to building large aperture telescopes," said David Taylor, president and chief executive officer of Ball Aerospace in Boulder, Colo.
DARPA eventually wants a space telescope with a collection aperture (light-collecting power) of almost 66 feet (20 meters) in diameter. By comparison, NASA's next-generation James Webb Space Telescope is designed to have an aperture of just 21 feet (6.5 m). But first, Ball Aerospace must create and test a 16-foot (5 m) telescope in the DARPA project's second phase. Phase three would involve launching a 32-foot (10 m) telescope for flight tests in orbit.